BACKGROUND AND PURPOSE: Our aim was to assess dynamic half-Fourier acquired single-shot turbo spin-echo (HASTE) MR imaging of the temporomandibular joint (TMJ) using parallel imaging, in comparison with static proton density (Pd) imaging. MATERIALS AND METHODS: Thirty-four TMJs from 17 subjects (7 volunteers, 10 patients) were imaged in a multichannel head coil on a 1.5T magnet by using a 35-second dynamic sagittal HASTE acquisition (TR/TE, 1180/65 msec; matrix, 128 × 128; section thickness, 7 mm; 30 images) and sagittal oblique Pd in closed- and open-mouthed positions (TR/TE, 1800/12 msec; matrix, 256 × 256; section thickness, 2 mm; 15 sections). Images were reviewed by 3 readers and rated for confidence of disk position, presence of motion artifact, range of motion, and presence of disk displacement on a 5-point scale. Consensus review of cases was also performed to assess disk dislocation and limited range of motion. RESULTS: More static examinations were rated as having motion artifact (19.6% versus 6.9%, P = .016), limited range of motion (30.4% versus 17.7%, P = .016), and disk dislocations (31.4% versus 22.6%, P = .071). Confidence ratings were higher on dynamic examinations (4.11 versus 3.74, P = .018). Chi-squared tests demonstrated no significant difference in consensus reviews of the 2 examination types. CONCLUSION: Dynamic HASTE TMJ MR imaging is a time-efficient adjunct to standard MR imaging protocols, producing fewer motion artifacts, additional range of motion information, and a dynamic assessment of disk position, when compared with static imaging. Further study is needed to evaluate the role of this sequence in diagnosing disk displacement. Clinical examination cannot reliably assess abnormalities of the temporomandibular joint (TMJ).1,2 MR imaging has become a mainstay in the evaluation of TMJ disorders, given its ability to noninvasively depict major regional anatomic structures and to demonstrate the presence of joint effusion and bone marrow signal-intensity abnormalities.2 Consequently, MR imaging has become the gold standard in diagnosing articular disk displacement.3,4 However, one of the criticisms of TMJ MR imaging is its inability to provide a dynamic assessment of the joint, relative to other technologies such as axiography5 or sonography.6 The aim of this study was to evaluate our initial experience with a dynamic half-Fourier acquired single-shot turbo spin-echo (HASTE) MR imaging technique, using parallel imaging, in comparison with static sagittal oblique Pd imaging. The study was performed in compliance with our Institutional Review Board and Health Insurance Portability and Accountability Act regulations. 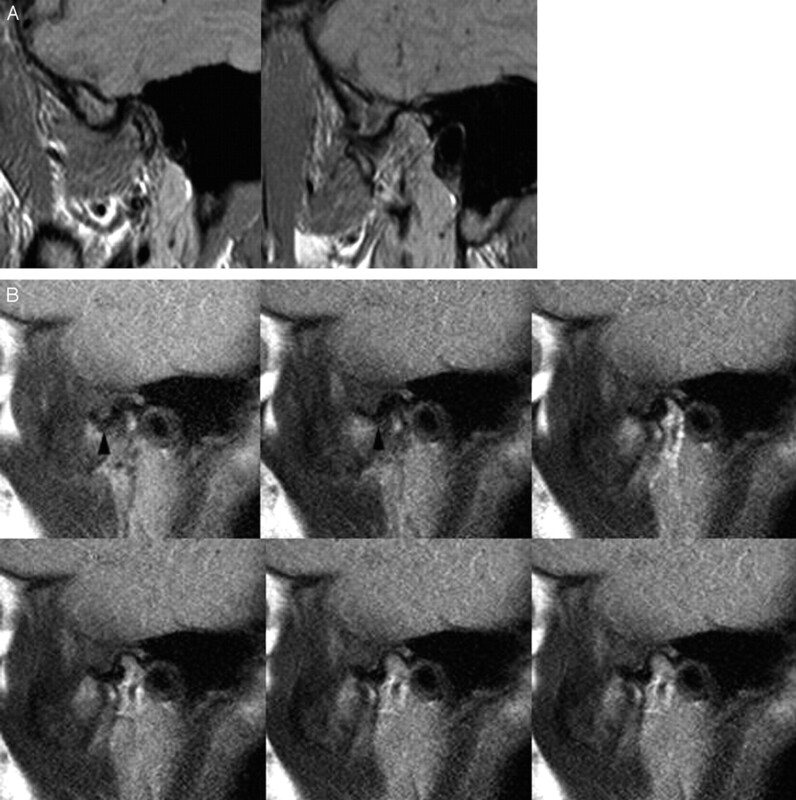 Seven asymptomatic volunteers and 10 patients had both TMJs imaged by using static and dynamic MR imaging, for a total of 34 joints; all images were acquired with a multichannel head coil on a 1.5T magnet (Avanto, Siemens, Erlangen, Germany). Image evaluation of patient data was performed retrospectively (the dynamic sequence studied was performed on all clinical studies); all subjects were assigned random subject numbers with concurrent elimination of all other patient identifiers. Written consent was acquired from volunteers, with similar elimination of patient identifiers. The static imaging protocol consisted of separate sagittal oblique Pd multisection acquisitions, obtained in open- and closed-mouthed positions. Open-mouthed imaging was performed with intraoral placement of a 30-mL syringe. Images were angled perpendicular to the long axis of the condylar head as determined from axial scout imaging and were obtained with the following parameters: TR/TE, 1800/12 msec; acquisition time (TA), 3:09 minutes; FOV, 13 cm; matrix, 256 × 256; and 15 sections of 2-mm thickness. For dynamic imaging, MR imaging was performed with a sagittal HASTE sequence with the following parameters: TR/TE, 1180/65 msec; TA, 0:35 seconds; FOV, 13 cm; matrix, 128 × 128; section thickness, 7 mm; and 30 images. The temporal resolution of this sequence was 1.17 seconds per image, and images were aligned along the direct sagittal plane, and not a sagittal oblique plane as performed with the static imaging. Imaging was performed in the same multichannel head coil. During this time, the patients were instructed to continuously but slowly open their mouths to maximal opening and then to continuously and slowly close their mouths, in a repetitive cycle. This was rehearsed with patients before imaging. Examples of static and dynamic imaging are demonstrated in Figs 1 and 2; additional video examples of the dynamic imaging in cine loop format are provided on the AJNR Website (www.ajnr.org) as supporting material. 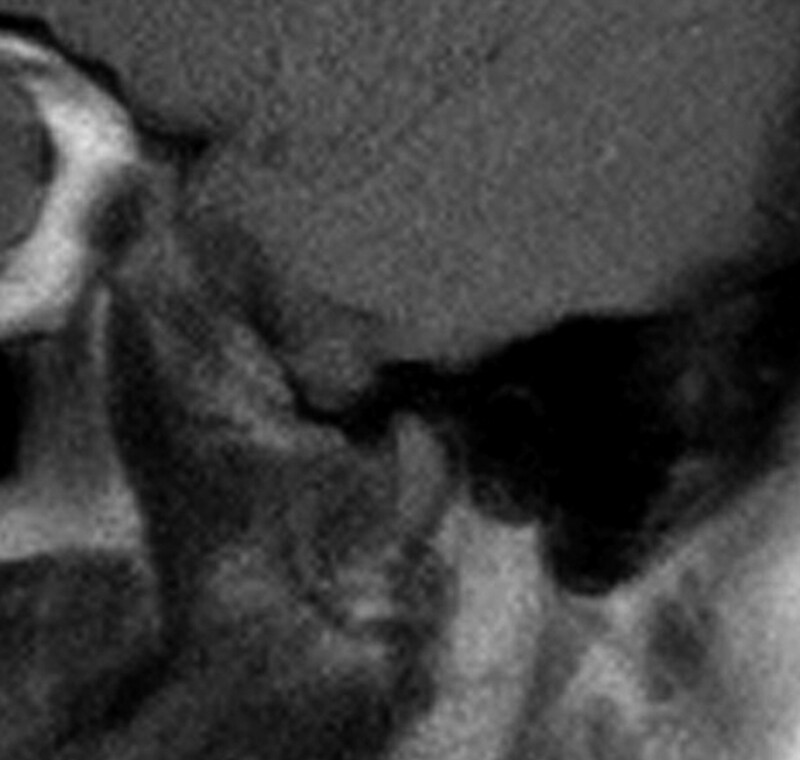 A, Static sagittal oblique proton-attenuation image of the TMJ in the open-mouthed position. B, Single frame from sagittal HASTE imaging series of the same temporomandibular joint. In both studies, the articular eminence (AE), condyle (C), and articular disk (arrowheads) are demonstrated. Selected images from dynamic HASTE series of imaging, from full closure to maximal opening of the TMJ. Three Certificate of Added Qualification–certified neuroradiologists (E.Y.W., A.O.N., B.K.P. ), each spending at least 50% of their clinical duties interpreting head and neck radiology studies with a combined postfellowship experience of 15 years, reviewed image datasets acquired from imaging workstations at standardized intensity scale and image size from both open- and closed-mouthed static images and dynamic images. Image sets were randomly sorted; specifically, imaging from different subjects was reviewed in random order. Each random static image set (composed of open- and closed-mouthed images) was followed by a random dynamic image set from a different patient and vice versa. When any 1 image set was reviewed, the corresponding dynamic or static image set was not available for review. The images were rated for the presence of motion artifact (none, mild artifact, severe artifact), range of motion (normal, limited, none), anterior disk dislocation (none, dislocation without reduction, dislocation with reduction), and reader confidence of disk position on an ordinal numeric scale (1 = poor, 5 = excellent). Following blinded assessment of images, a separate consensus review of range of motion and disk dislocation was performed by all 3 neuroradiologists, with review of static and dynamic datasets from the same patients conducted at the same time. Mixed-model regression was used to compare reader confidence scores between examination types (dynamic, static), whereas generalized estimating equations (GEE) based on logistic regression models were used to evaluate differences between the examinations with respect to a binary classification of confidence as high (score of 4 or 5) versus low (score <4), as well as the assessments of motion artifacts, range of motion, and dislocation, given clustering of data. A separate analysis was also conducted for each outcome measure. In each case, the outcome measure constituted the dependent variable, and the regression model included reader identification and examination type, as fixed classification factors, and the term representing the interaction between reader and examination type (to test whether the difference between examination types varied across readers). The covariance structure was modeled by assuming observations to be correlated or independent when derived for the same joint or different joints, respectively, with the strength of correlation dependent on whether the results were provided for the same joint. Chi-squared tests were performed to assess consensus data, comparing examination type and ratings of either disk dislocation or limited range of motion. In 5 of 17 patients (29.4%), repetition of dynamic imaging was required to ensure continuous motion of the TMJ (as determined by the technologist), with 1 subject requiring 3 acquisitions for 1 side. Because only 1 result of “no motion” was logged out of 102 ratings, this score was changed to “limited” to allow a binary logistic regression model for GEE analysis and to lessen the adverse impact of rare outcomes on the statistical analysis. No significant interaction between examination and reader type was noted (P = .99), indicating that differences between examination types and the likelihood of detecting motion artifact were not dependent on the reader. Significant differences in the percentage of times that motion artifact was noted were seen between readers (P < .001) and examination types (P = .016); motion artifacts were more frequently detected with the static examinations (19.6%) than with the dynamic examinations (6.9%) (Table). The classification of “none” was only seen on 4 occasions. As such, a binary logistic regression model was used for the GEE analysis to assess normal motion versus limited (and severely limited) range of motion. No significant interaction between examination and reader type was noted (P = .29), indicating that differences between examination types and the assessment of range of motion were not dependent on the reader. Statistically significant differences among readers (P < .001) were noted, as were significant differences between examination types (P = .02) in terms of the range of motion ratings; a joint was significantly more likely to be assessed as being limited in its range of motion on static MR imaging (30.4%) than on the dynamic imaging (17.7%) (Table). Again, a binary logistic regression model was used for GEE analysis. A statistically significant interaction was present between reader and examination type (P < .001), suggesting that differences between static and dynamic examinations and the detection of dislocation varied from reader to reader. Specifically, reader 3 was found more likely to rate a disk as dislocated on dynamic MR imaging examination, whereas the other readers were more likely to rate dislocations on static examinations. Differences between the static and dynamic MR imaging and the identification of the dislocation were only statistically significant for reader 1 (P = .04; and P = .07 and P = .19 for readers 2 and 3). When the data from reader 3 were omitted, the interaction between reader and examination type was no longer significant (P = .47) and the percentage of times that disks were rated as dislocated by the remaining readers was significantly higher (P = .03) for the static examinations (29.4%) than for the dynamic examinations (10.3%) (Table). The weighted kappa for the assessment of agreement between the dislocation ratings given by different readers for the same joint was 0.133 (poor interobserver agreement) for the dynamic MR imaging and 0.231 (poor agreement) for the static MR imaging. Because a reader never evaluated the same joint more than once using the same type of examination, the only valid measure of intrareader variability was the kappa for the agreement between the dislocation assessments provided by the same reader for the same joint using each of the 2 examinations; the weighted kappa for intrareader agreement was 0.375 (poor-to-moderate agreement; range of 0.398 for reader 1 to 0.456 for reader 3). Mixed-model analysis of confidence scores revealed significant interaction between reader and examination type (P = .03), suggesting that differences between the examinations and confidence ratings varied between readers. Confidence scores of static and dynamic imaging were significantly different in readers 2 and 3 (P = .045 and .0006, respectively) but were not significantly different for ratings from reader 1. GEE analysis of a binary classification of confidence as high (4 or greater) or low (3 or below) demonstrated no significant interaction between reader and examination type (0.099) or significant difference between examination types (P = .06) or between readers (0.856) and the frequency of high confidence scores (Table). Average ratings for static and dynamic examinations were 3.69 and 4.07, respectively. When studies were reviewed by consensus, the degree of disparity between the types of studies was diminished (Table). Chi-square tests demonstrated no statistical significance between the examination types and consensus ratings of either disk dislocation or motion artifact. A review of individual cases demonstrated that 4 cases of disk dislocation were identified only on dynamic imaging, whereas 3 cases of dislocation were identified only on the static imaging. Limited range of motion was identified on the dynamic imaging alone in 1 case and on static imaging alone in 4 cases. Dynamic and pseudodynamic TMJ MR imaging techniques have been advocated by multiple investigators in the past, with work as early as 19875,7–13; additional information that can potentially be provided by dynamic MR imaging includes disk deformation and movement under loading and an assessment of dynamic condylar translation. By improving the temporal resolution of imaging, dynamic imaging could potentially depict pathology seen only during the course of opening and closing that might otherwise be missed by static imaging. Some advantages of the dynamic HASTE TMJ MR imaging protocol used in this study include the ability to obtain dynamic imaging in a time-efficient manner, without the need for dedicated imaging coils or additional appliances. Increase in the speed of acquisition is improved with the HASTE technique,14 with additional decreases in acquisition time obtained from reducing the matrix and applying a parallel imaging-acceleration factor of 2. We found that increasing the acceleration factor beyond this point resulted in unacceptable image noise. Whereas many gradient-echo dynamic sequences are available, we elected to use the HASTE technique to reduce the amount of susceptibility artifact (Fig 3). Although patient cooperation and some patient preparation are important for good results, we found that all patients were able to comply with the instructions given. Additionally, given the short sequence time of the dynamic sequence, multiple acquisitions are easily obtained. A, Static sagittal oblique proton-attenuation image of the TMJ. B, Single frame from a sagittal HASTE imaging series of the same TMJ. Reduced susceptibility artifact (asterisks on both images) is noted on the HASTE imaging. Some shortcomings of this methodology include poor delineation of the posterior margin of the disk on the fully closed position, though this margin is typically visualized on the subsequent frame of motion (Fig 4). Additionally, although imaging can take place during active opening and closing, the temporal resolution of the study still requires relatively slow motion on the part of the patient; our patients are instructed to count to 10 while opening and while closing. Moreover, although there is improvement in the physiologic simulation of dynamic opening and closing, the supine position is not physiologic and could result in some posterior displacement of the mandible.5 With respect to the static images, the use of a 30-mL syringe may partly account for the low specificity of the static open-mouthed images, given the relative inability to customize the degree of opening relative to a bite wedge. The current sequence also demonstrates some increased image noise with respect to static imaging. Single frame from a dynamic sagittal HASTE series demonstrates poor delineation of the posterior band of the articular disk. The study itself was limited by the inability to blind readers to the imaging technique, given the disparate nature of the images produced. Moreover, a correlative measure of disk position by using a non-MR imaging technique was not available. Our results demonstrate that dynamic HASTE MR imaging is associated with decreased motion artifacts, despite ongoing motion of the joint. This is likely a function of the temporal resolution of the HASTE MR imaging (just more than a second), differences in the time of acquisition between the static and dynamic MR imaging studies (5:34 minutes versus 35 seconds), and the need for 2 sets of imaging for the static images. Although we found a higher average confidence score for the dynamic examinations, differences in the number of examinations rated as high-confidence studies (4 or 5 on the rating scale) were not statistically significant. Moreover, despite the high-confidence scores reported, poor interobserver variability was noted in ratings of dislocation, and poor-to-moderate intraobserver variability, in the assessment dislocation on dynamic and static MR imaging. These discrepancies may be due to a number of factors. Evaluation of subtle disk dislocations on static MR imaging may be limited by signal-intensity abnormalities within the disk. Partly due to volume averaging (7- versus 2-mm section thickness), the disk appears as a well-defined hypointense block on most dynamic MR imaging studies (Fig 1), which differs from the relatively reduced image contrast that can be present with static Pd imaging, particularly in the setting of disk degeneration. At the same time, on dynamic images, the posterior margin of the posterior band is poorly visualized on full closing, though it is visible on the subsequent images. Consequently, minimal anterior dislocations diagnosed on static imaging on the basis of posterior band position relative to the condyle could be missed on dynamic imaging. Differences in angulation (sagittal oblique versus sagittal) may also have complicated comparisons in ratings of disk dislocation. Finally, the high degree of variability in assessments of dynamic imaging may relate to the absence of established imaging criteria for diagnosing disk dislocations with this type of imaging; on the basis of our consensus readings, some criteria we would propose include direct visualization of disk-material reduction, abnormal anterior convexity of the anterior band of the disk, and absence of intermediate-zone interposition between the condylar head and articular eminence. A review of consensus data demonstrated that differences between the imaging study types were less notable. In our group of subjects, we noted 4 joints in which a reducing disk dislocation was more obvious on the dynamic imaging (Fig 5). In these cases, reducing disk material could be seen on images during an intermediary range of motion not depicted on static imaging. This raises the possibility that there are dislocations that are being missed on routine static imaging because displacements and reduction may be most notable at a stage of motion not sampled. Cases in which disk dislocations were seen only on static imaging were found to be those in which the posterior band of the disk was minimally anteriorly displaced along the condylar head in the closed-mouthed position. 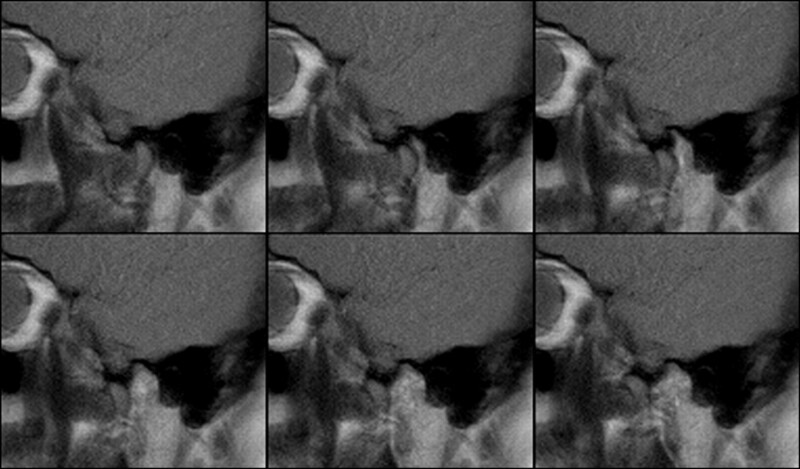 A, Closed- and open-mouthed static sagittal oblique proton-attenuation images and (B) selected frames from dynamic sagittal HASTE image series, acquired from the same TMJ. Anteriorly displaced disk material (arrowheads) is more clearly identified on the dynamic series, with reduction of material seen by the 3rd image. In our study, dynamic HASTE MR imaging demonstrated a higher likelihood of normal range of motion ratings on independent assessments. Consensus reviews of range of motion demonstrated 4 cases in which motion was limited only on static imaging. These results may relate to a greater likelihood of imaging the full range of motion of condylar translation due to the temporal resolution of the study and the use of voluntary motion, rather than a fixed intraoral device to stent open the mouth. Additionally, the maximal degree of transient opening of the mouth may be greater than that which is possible for longer lengths of time. We believe that the dynamic HASTE MR imaging gives a more accurate assessment of TMJ range of motion; these findings are in agreement with recent work by Beer et al15 demonstrating good correlation in range of motion between ultrafast turbo spin-echo imaging and axiography. Correlation with open surgical findings or sectioned cadaveric materials is needed to confirm the global position of the articular disk with a non-MR imaging technique.2 Given the interobserver and intraobserver variability noted, we plan further study with cadaveric anatomic correlation and a variety of dynamic and static MR imaging protocols to help establish and validate imaging criteria for disk displacement on dynamic imaging. Until this characterization of dynamic disk position evaluation is performed, it is likely that static MR imaging will remain the mainstay in this assessment; in its current state, dynamic MR imaging represents an adjunct for the evaluation of TMJ range of motion and not a replacement for static imaging sequences. We also hope to perform dynamic assessments by using recording devices to demonstrate the position of joint structures at the moment of subjective joint clicks and to use graphic depictions of disk and condyle motion to further characterize the function of the TMJ. Finally, we plan to correlate imaging findings on dynamic and static examinations with subjective patient ratings of pain and clinical examination findings. Our initial experience has demonstrated dynamic HASTE MR TMJ imaging to be a time-efficient adjunct to standard TMJ MR imaging protocols, producing fewer motion artifacts, additional range-of-motion information, and a dynamic assessment of disk position, when compared with static imaging. Further study is needed to evaluate the role of this sequence in the diagnosis of disk displacement. Paper presented in part at: 44th Annual Meeting of the American Society of Neuroradiology, May 6–12, 2006; San Diego, Calif. Accepted after revision October 10, 2006.